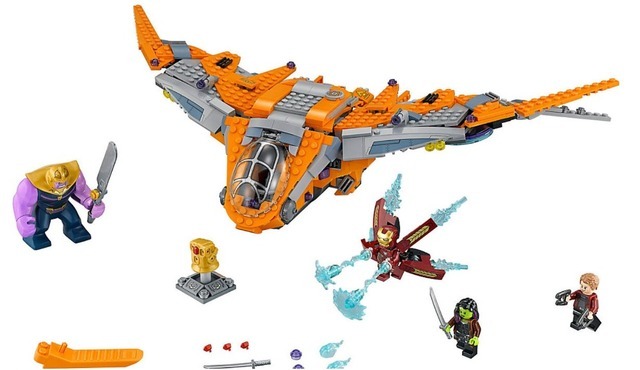 Fly into conflict on an uncharted planet aboard The Guardians’ Ship with Iron Man, Star-Lord and Gamora in this Marvel Super Heroes 76107 Thanos: Ultimate Battle set. 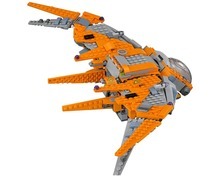 The Guardians’ Ship features an opening cockpit for 2 figures seated on the space scooter, stud shooters, plus an opening rear compartment with capacity for 2 figures and the Infinity Gauntlet and stand. The Infinity Gauntlet, which has attachment points for the included Infinity Stone and other collectable Infinity Stone elements, can be attached to the Thanos big figure. 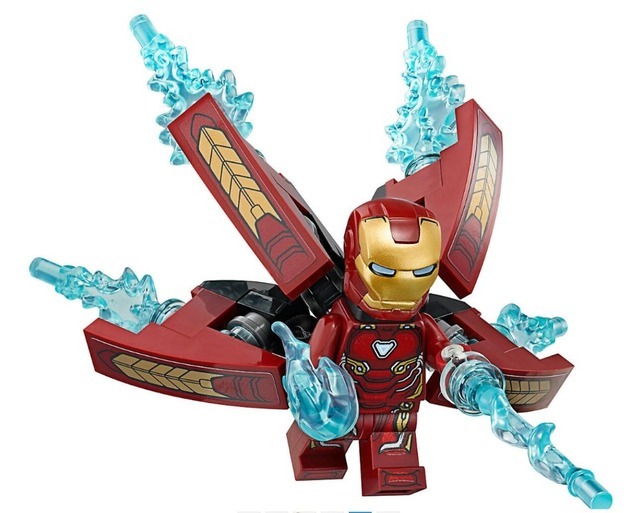 This exciting set features 3 figures with assorted weapons and 10 Power Burst elements. 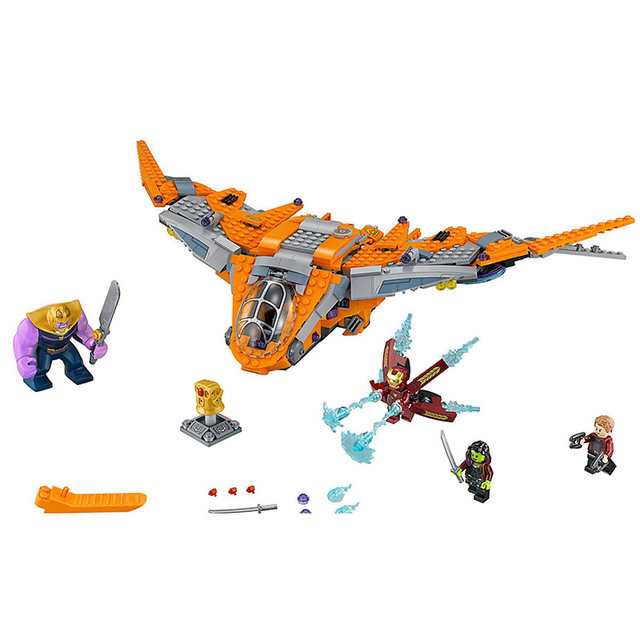 Includes 3 figures: Iron Man, Star-Lord and Gamora, plus a Thanos big figure. The Guardians’ Ship features an opening cockpit for the space scooter (and 2 ifigures sitting on the scooter), flip-up windshield, opening rear compartment with 2 figure seats, removable roof and space for the Infinity Gauntlet and stand, 2 stud shooters, adjustable wings and a connection point for the escape pod (featured in 76102 Thor’s Weapon Quest). 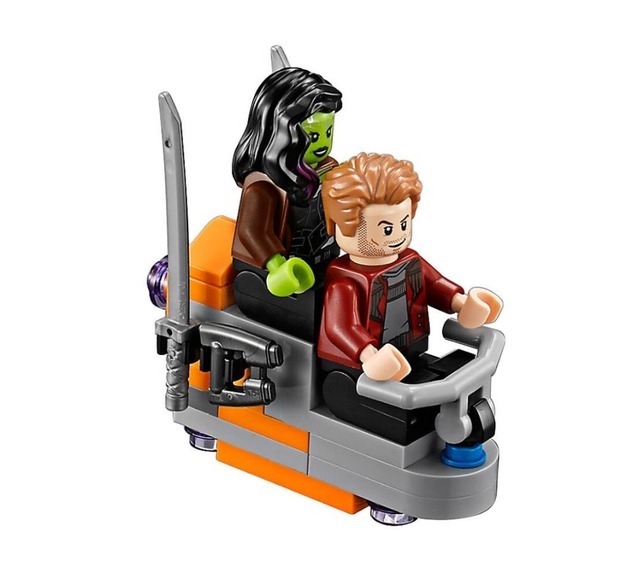 Space scooter features 2 figure seats, attachment points for Star-Lord and Gamora’s weapons, and a detachable sword. Replace Thanos’ left hand with the Infinity Gauntlet. Weapons include Star-Lord’s 2 laser guns and Gamora’s sword. Also includes 10 assorted translucent-blue Power Burst elements to customize your builds and figures.